Bay Area-based chanteuse/guest blogger Pamela Rose is relieved to hear that Reese Witherspoon, star of the forthcoming Peggy Lee biopic, considers the jazz icon to be first and foremost a songwriting genius. I don’t like Hollywood biopics about music icons. I can almost predict the story arc, the struggle of the early years, the montage of increasingly better nightclubs, cars and homes, a painful descent into booze and drugs, the scene where the bottle shatters against the wall, the humbling climb back from the abyss into the sunlight of an adoring public. 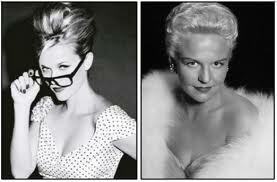 So you might imagine my concern upon learning of a movie in the works about Peggy Lee, one of my musical heroines. Even with a gifted writer like Nora Ephron on the project, and the talented Reese Witherspoon apparently hand-picked by Ms. Lee’s family to play the leading part, will Hollywood see beyond the sultry icon? The memory of her warm, purring stage persona makes it easy to underestimate what a hardworking, canny businesswoman and musician she actually was. And of course, the chilling truth about Peggy’s childhood – she was raised by a physically abusive stepmother -- and her unlucky marriages, will make such a strong onscreen story, one might never be allowed to celebrate Peggy’s delicious creativity and enduring passion for arranging and writing. So it came as a great relief, while watching a TV interview with Ms. Witherspoon, to hear the actress characterize Peggy Lee first and foremost as a songwriter. Many people aren’t aware of how prolific and dedicated a writer Peggy was. It was fairly unusual for a pop singer in the 40’s and 50’s to record and publish so many original songs. Writing at first with her guitarist husband Dave Barbour, she later worked with collaborators as diverse as Harold Arlen, Duke Ellington, Quincy Jones, Marian McPartland and Michel Legrand. Peggy produced hit after hit for vinyl, television, Broadway, Hollywood and even animated features. And let’s not forget that when she added her two hip verses to Little Willie John’s “Fever” (“Romeo loved Juliet...Captain Smith and Pocahantas”), she helped transform the song into a classic. Peggy liked to write with the rhythm of a lyric in mind and a cadence suggested by a phrase. As a vocalist, she knew just how to marry a lyric to melody that felt natural and easy, relaxed and true. Listen to her song “I Don’t Know Enough About You” for a terrific example of that silky, simple melodic line. And her dark, torchy “Don’t Smoke in Bed” doesn’t waste a single syllable or note in delivering its dramatic message. (I also love K.D. Lang’s version of this song, if you’re curious to hear another singer do it). I think my favorite Peggy Lee story -- and I’ll be interested to see if this comes out in the movie -- was when she sued Walt Disney Studios. But when the film was released on video in the 1970ʼs, the estimated additional $90 million in sales to Disney was too much for the determined Ms. Lee to leave alone, and after a fifteen year court battle, she successfully sued them for a landmark $3.8 million in back royalties. That famous settlement liberated musicians and artists from Disney's draconian policies. She was seventy years old when the case finally settled, and certainly didn’t need the money. What made her persist with the suit all those years? Perhaps it was her passionate belief in the power of the working musician. Even after becoming a big star, Peggy always related to “the band” – the musicians, composers and arrangers whom she considered her fellows. Incidentally, you won’t see Peggy’s name on the song credits for “Don’t Smoke in Bed.” She took her name off to benefit her co-writer, Willard Robison, who was struggling with ill-health and financial hardship. I’m hoping the movie version of Peggy Lee captures the generous, driven, perfectionist, vibrant and creative woman that she truly was. Recognizing her as a songwriter seems like the right place to start.